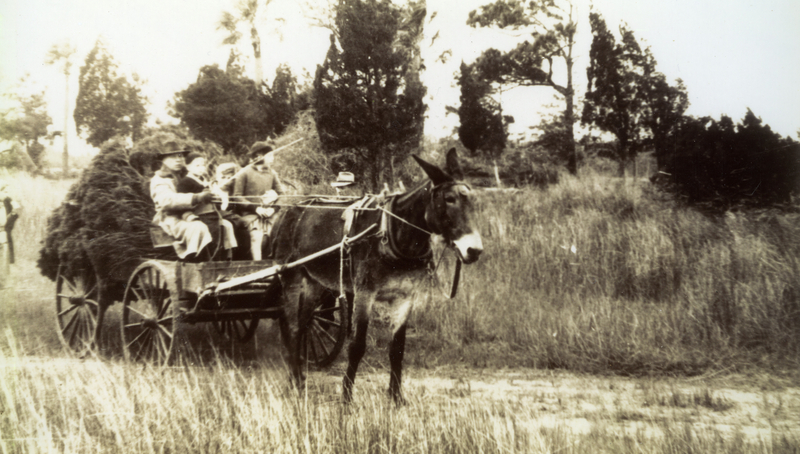 In the tradition of online media’s “Throwback Thursday,” wherein people post photos of past events and wardrobes, I thought I would share this photo from (probably) 1926, when the Huyler Family lived on the island, and went out with Jane the mule to chop the Christmas tree. At high tide the trip from Charleston to Dewees with building materials, furniture, and/or food took approximately an hour and a half; three when the tide was low. Twice that long for a round trip if we did not run aground. 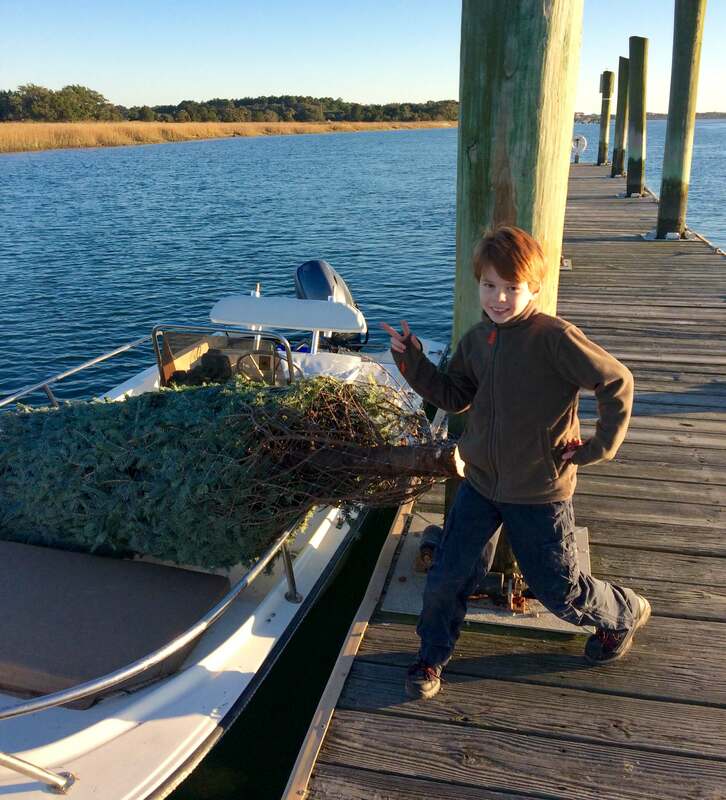 On Christmas Eve we ran aground! 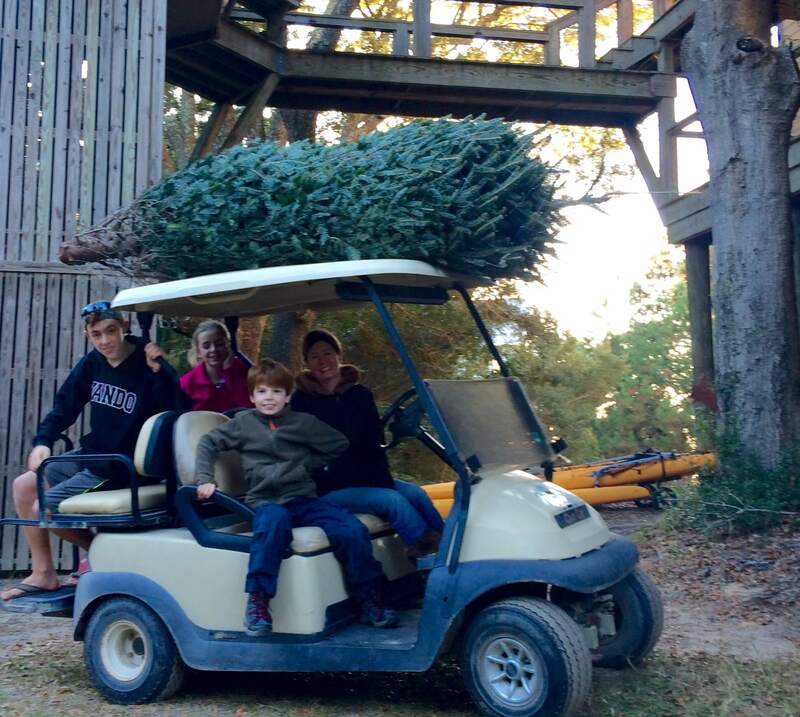 The most exciting voyage of the season was the trip to Charleston in the V-V to fetch Dad that Christmas Eve. I was in a dither. What if we were not back by the time Santa Claus came? … Off we went in plenty of time for Gwyn, Charles, Coulter, and Mum to do last minute Christmas shopping in the city, as well as for Mum essential grocery shopping. As you can imagine, we did not voyage to the city frequently, because of the 3-4 hours required just going and coming. Dark was descending rapidly as the V-V left Adger’s wharf, crossed Charleston Harbor, and headed into the channel. I was beside myself! Santa might be coming right then, and we weren’t home. Things got a bit better when someone assured me that [the staff] would see to it that Santa left our presents… But we really ought to be there. Mr. Moore at the helm puffed imperturbably on his pipe as he steered from one channel light to the next. Then it happened! The V-V ran aground. The grownups said that one of the channel lights had burned out. There we were; and we had struck ground on an ebb tide! It would be 12 hours before the V-V would float free on her own. If I was worried before, I was anguished now. Over the side into the cold water went Coulter and Charles and Dad. As Mr. Moore reversed the engines, the man and two boys pushed as hard as they could. Dad was a powerful bull of a man. Every minute there was less water as the tide carried it to the sea. The V-V was grounded at the prow; so Mum and Gwyn moved all the cargo and themselves aft. By some miracle and every ounce of their strength Dad and those teenage boys managed to move that boat an inch or two; then six; then she floated free and the three men climbered aboard, [sic] wrapped themselves in the Army blankets which Mum always kept at hand for emergencies; and hovered over the stinking engine for warmth. The spark of hope was re-ignited in me. Maybe– just maybe– we would reach home before Santa Claus did… We reached home shortly after midnight to a roaring fire, a hot dinner, and some tears of relief. Jack Huyler’s entire Dewees memoir can be read here. Jack died in early 2014– you can read more about him here. We have a lot of these cards printed as holiday cards– let us know if you’d like some. Yesterday, the Archives committee sponsored an expedition through Copahee Sound to understand what it might have been like to visit the Huyler Family in the early-twentieth century. We met at the dock, and in the face of prevailing 20 knot winds, decided to leave the kayaks behind. Jill started us off by reading from Anne King Gregorie’s description of coming to the island, as found in Jim’s book, Dewees: The Island and it’s People. The traveler who follows the modern pavement of the ancient “path” from Charleston to Georgetown, may notice about 9 miles from the Cooper River Bridge a wide dirt road bearing to the east and marked, “Dewees Island – Coulter Huyler.” If, in an adventurous mood he follows this road, he will find that it ends after a mile or so in a little hamlet in the tidewater called Porcher’s Bluff. Low in the haze of the horizon beyond the salt marshes he will see a blue line of sea islands, with Dewees and Capers, in the stillness of magic solitude, straight before him. Leading out to the channel a thousand feet from shore is a footbridge flanked by a flag staff. Having come thus far, our traveler will now demand that we take him further. So we open the box at the base of the flag staff, run up a signal to the breeze, and in a few minutes we see a white motorboat coming. We meet it at the end of the pier, and stepping on a board we find shelter from the fresh sea wind, draw warm rugs over our knees, and speed through the dancing water to the enchanted islands ahead. While sea birds dip and cry about us, and schools of fish flee from their pursuers, we relax in the freedom of the open, and before we know it we are debarking upon the white sands of Dewees. After discussing our route with each of the three afternoon captains, we embarked on this reverse journey. To be sure, the skimmers, oystercatchers, and pelicans “dipped about us,” and we “relaxed in the freedom of the open”. 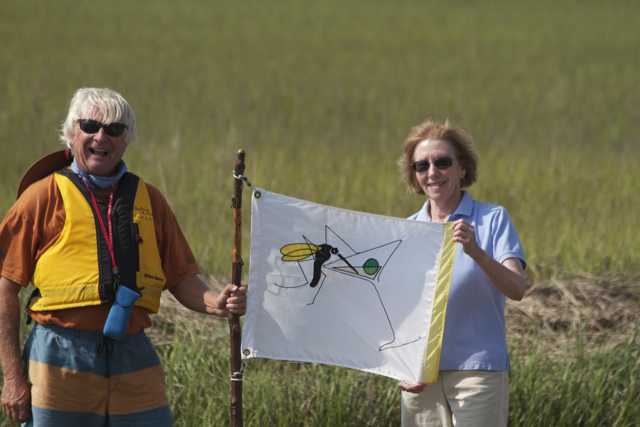 We meandered through the marshy creeks of Copahee sound until we could see the point from which the flag was raised nearly 90 years ago, and then we tossed an anchor into the mud, rafted up and toasted the intrepid folk who made that journey frequently. We watched the tide encroach on the oyster flats, enjoying each other’s company in a different setting, imbibing the champagne and other picnic delicacies. Eventually we pulled anchor and headed for Dewees and home, watching the colors change as the sun sank lower over the marsh. I sit at the end of the dock, listening to water slapping against the posts. The tide is full, and Porcher’s Creek winds bluely through it’s host, the marsh grass, spring’s green already filling winter’s brown stems. Across the creek, marooned in a halo of marsh, lies a dream isle, and indian shell ring, palmettos rising evergreen and graceful along its beach, live oak dipping its egret-clad branches into the water. 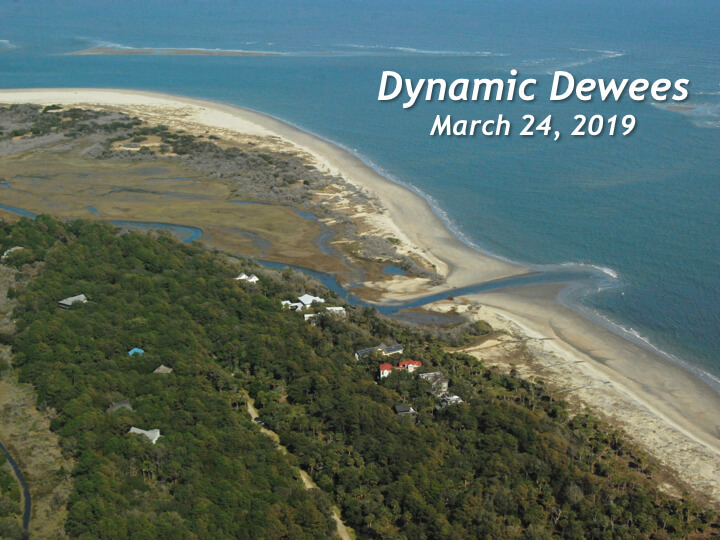 Beyond that, Copahee Sound, a blue sheet of water stretches out its four-mile-long arms to embrace Dewee’s and Capers, barrier islands whose serried tree are a tropic silhouette of yet more Palmettos. 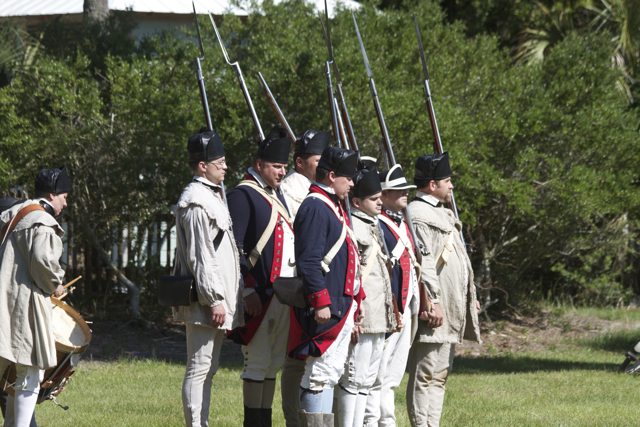 Our Revolutionary War celebration brought us a number of fascinating re-enactors. We had a chance to catch up with them and find out what makes them drawn to re-enacting and why they choose to make history come to life. We spoke at length with Sargeant Major Bert Puckett, who has been a re-enactor for years and just retired from the Army. He is currently searching for his next job, which he hopes will give him a chance to continue this hobby that is an academic pursuit. Both Bert and Bob have been stationed at Fort Bragg, both have spent more than 20 years on active duty and both found interesting parallels between the Revolutionary War and modern conflicts in Bosnia, Iraq, and Afganistan. 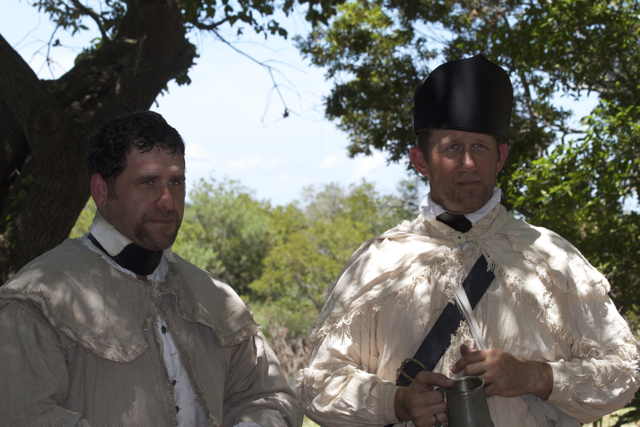 In preparation for a re-enactment, they review some of the curt orders of Francis Marion as well as the protocol of the re-enactment division. The recruit having received his necessaries, should in the first place learn to dress himself with a soldier-like air; to place his effects properly in his knapsack, so as to carry them with ease and convenience. He is to learn how to salute officers when he meets them, to clean his arms, wash his linens and cook his provisions. He must accustom himself to be able to dress in the night; and for that purpose, always have his effects in his knapsack and be placed where he can put his hands on it in a moment, that in case of alarm he may repair with the greatest alertness to the parade. When learning to march, he must take the greatest pains to acquire a firm step and proper balance, practicing during his leisure time. He must accustom himself to the greatest steadiness under arms, to pay attention to the commands of his officers, and exercise himself continually with his firelock. A company is to be formed in two ranks, at distance, with the tallest men in the rear, and both ranks sized, with the shortest men of each in the center. A company thus drawn up is to be divided into two sections or platoons; the captain to take post on the right of the first platoon, covered by a sergeant; the lieutenant on the right of the second platoon, also covered by a sergeant; the ensign four paces behind the center of the company; the first sergeant two paces behind the first platoon, and the eldest corporal two paces behind the second platoon; the other corporals are to be on the flanks of the front rank. Bert and Bob have both been to Dewees Island before as guests, and they delighted in our uncrowded beach. They were both always interested in history. They joke that their families may like the dress-up part the best, but they are drawn to what they call “experimental archaeology.” They stressed that it was not just the history but the replication of materials and processes… making their own shoes, for instance. They dissolved steel wool in vinegar for several days to make a solvent that actually changes the composition of leather, making a blackener that won’t wash off. 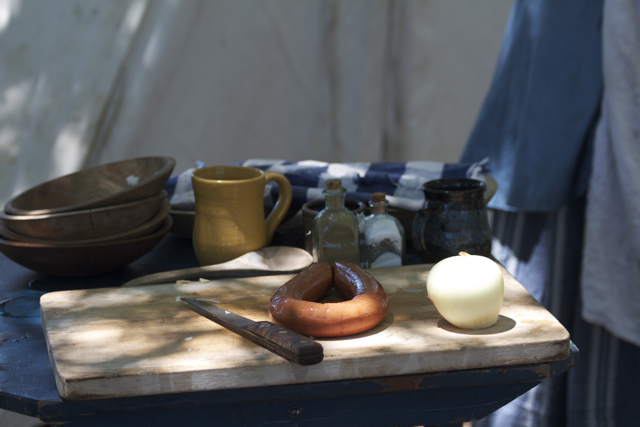 They described using historical methods exclusively for a three day encampment. “I’m a professional soldier and I was just smoked, ” Bert recalls, describing his exhaustion after that exercise. We thank them for making history come to life on our little island, and bringing to the forefront the role Dewees played in the Revolutionary chapter of the State’s history. Today marks the sesquicentennial of the first shots of the Civil War. We woke to a barrage of cannon fire near our home in Mount Pleasant, as the community begins to commemorate (the paper is carefully worded– not “celebrate”) this complex chapter in American History. We live four houses over from where the Massachusetts 54th was headquartered, and our windows are rattling the same reverborating rattle that they probably did in 1861, thirty years after the house was built. We have found civil war buttons and cannonballs in the backyard. I spoke with Lori this morning and found out that the noise is, indeed, audible on Dewees. What an astonishing thing it must have been for the residents then, who weren’t able to tune into the tv, radio, or internet and find out what exactly was going on. 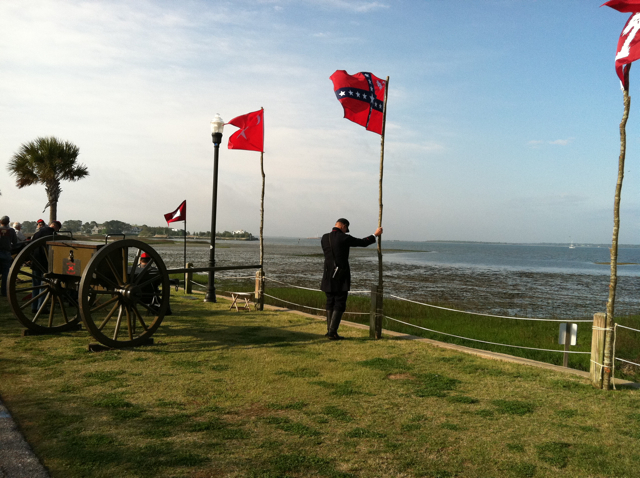 If you are on the island, you should be aware that the cannon volleys will be going on throughout the day, until evening, when there is a ceremony at Fort Sumter. 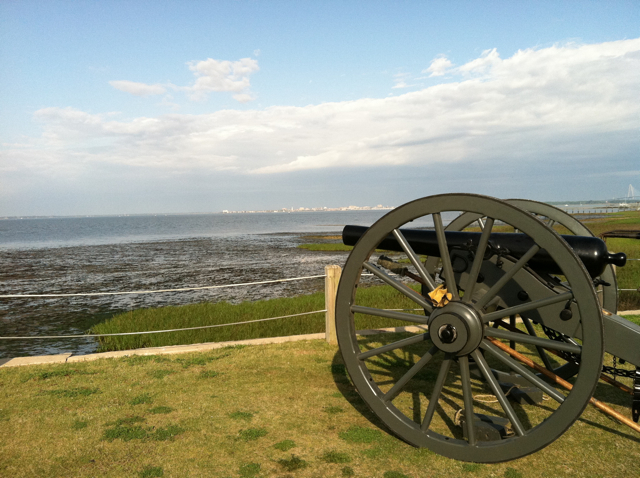 Cannons (and some encampments) are stationed around the area: on the old Pitt Street Bridge, Fort Moultrie, Fort Johnson, Fort Sumter, Patriots Point, the Charleston Battery, and possibly even more places. 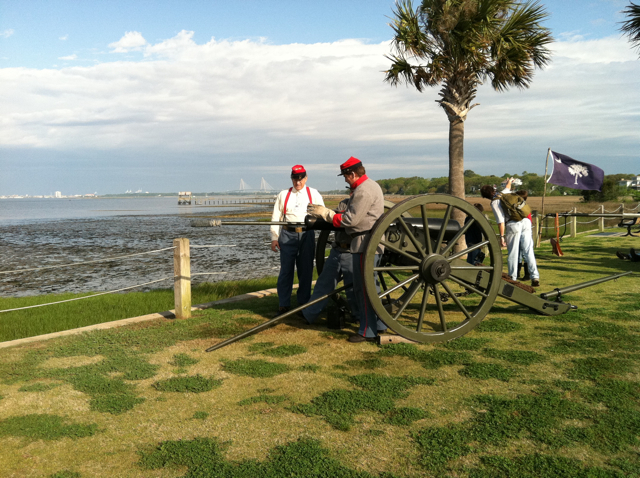 Here’s a quick 10 second video of a cannon firing from the Old Pitt Street Bridge. And if you haven’t been following local journalist Brian Hicks’ columns in the Post and Courier about the war, you should check it out. 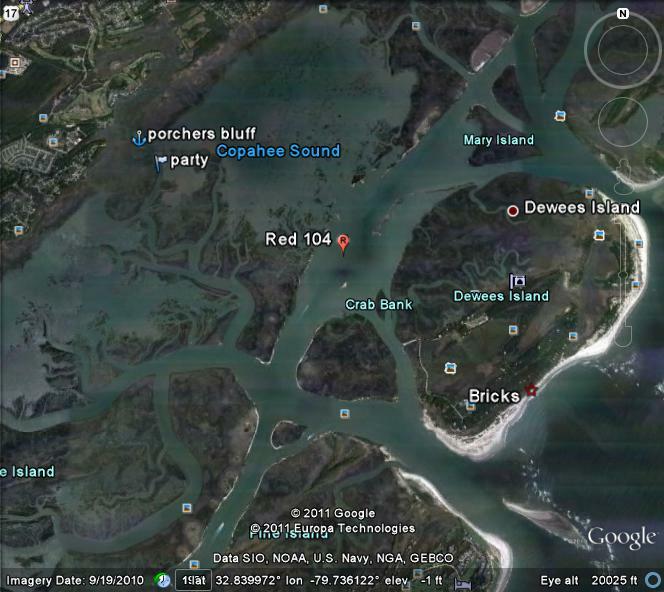 The blockade runner was hugging the shore of Dewees Island, trying to sneak into Charleston Harbor before first light. While most of the story isn’t about Dewees, it’s still nice to see the mention. You can read the full article by clicking here. 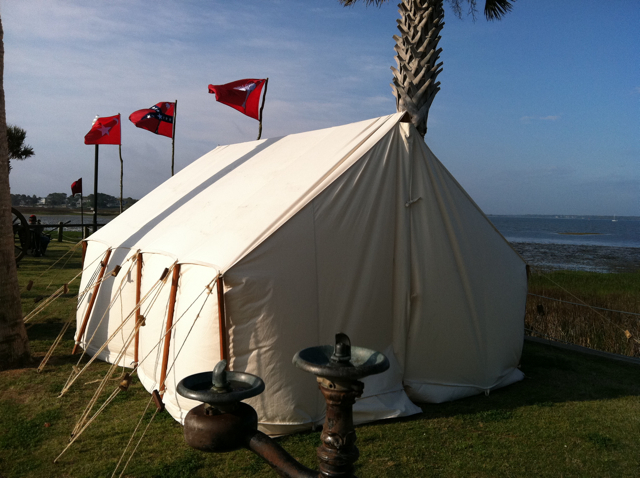 On Saturday, the Dewees Island Archives Committee is putting together a talk on the Sewee Indians. Jonathan Lyons, of Awendaw, will be speaking at the Huyler House from 5:30 to 7:30. Wine and appetizers are included, and I have it on a pretty good source that we will be having an event-appropriate oyster or two. I am really looking forward to learning more about the early indigenous people of South Carolina. In the fall, I was captivated by a speech at the SC Natural History Society about the Shell Middens of South Carolina. So I did a little more research, and I can’t wait to learn more. 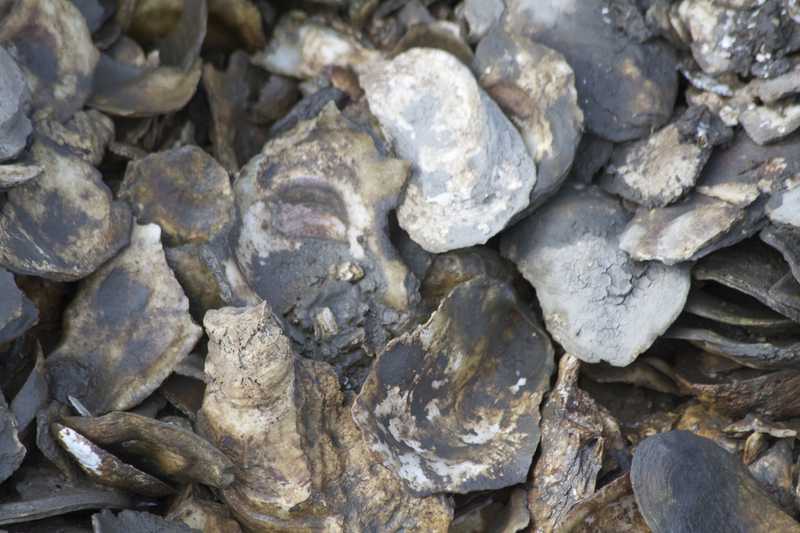 Shell middens are piles of oyster shells left behind by some prehistoric society. They are one of the earliest large-scale features of the United States, but they actually occur in different forms in coastal areas all around the world. There are at least 22 known sites in South Carolina, and the easiest one to walk to is not far from Dewees as the crow flies. Located near Awendaw in the Cape Romain National Forest, it is accessed by a boardwalk. We can surmise that the people who inhabited it were well familiar with our island as well. Radio carbon dating of shells shows that the Sewee shell midden was built about 4000 years ago. There is evidence of a complex hunter-gatherer society, but we don’t really know very much about these early native Americans. The Sewee mound is in a C-shape, while many similar sites in South Carolina are round. this has led to some interesting theories. Some archaeologists have speculated that it was probably a whole circle at one point, but sea level rise and storms over the last 5000 years may have affected the shape of the circle. Others, noting U and C shaped mounds in Florida, and believing that the area was used for ceremonial and feasting purposes, hypothesize that it was open-ended so that it allowed the community to grow over time. I decided to check out the midden in the National Forest in December. And I have to say, if there hadn’t been signs saying that this was a shell midden, I may have mistaken the trail for a simply beautiful walk in the woods, but little else. It is an easy and gorgeous hike in the Francis Marion National Forest. There are some signs explaining the site, but if you were exploring and the signs weren’t there, it would be easy to miss the whole thing. But the trail is well marked, and there are interpretive signs along the way. On a crisp fall day, all you can hear is the rustle of the wind in the pines and palmettos, the whine of a distant boat on the water, and the clicking and spitting of the oysters themselves in ancient rhythm. You’ll have to imagine a bustling settlement of people making camp here on the high ground. A slideshow of more photos is below, as well as a myriad of links to informative sites. The earth will know you have been here. 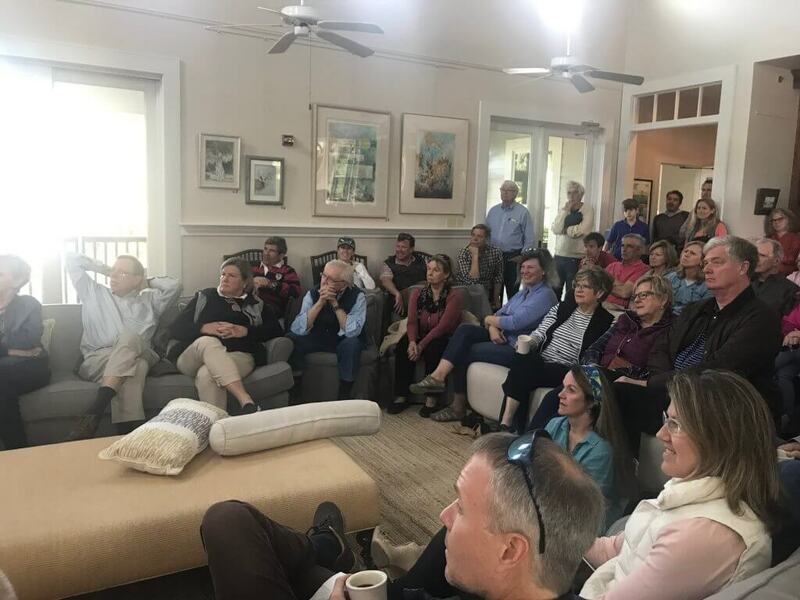 That was the theme of a lecture last week hosted by the Charleston Natural History Society (aka our friends at Audubon who help with our bird counts.) The speaker was Patrick McMillan, an engaging naturalist from Clemson who has a regular SCETV program called Expeditions. 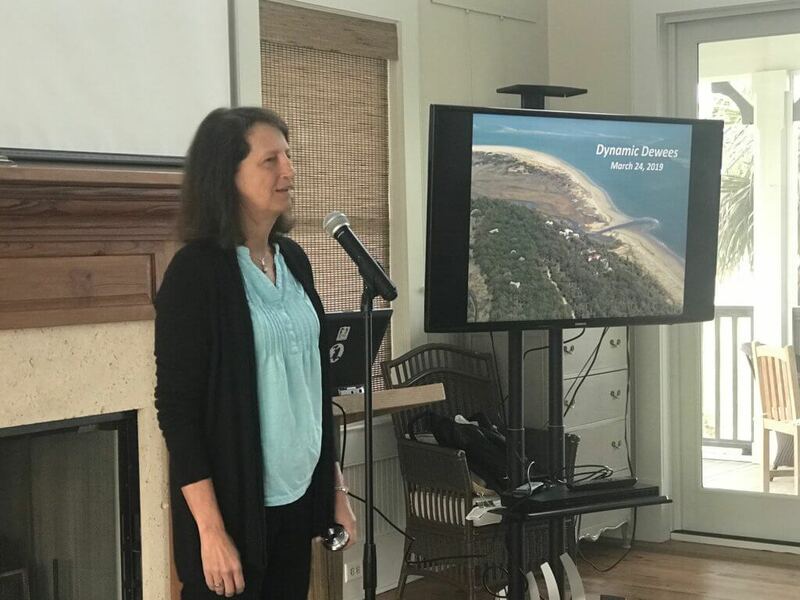 Dr. McMillan provided lots of compelling data about protecting earth’s fragile resources, which was very interesting, but the reason I went was that the lecture was about shell middens. 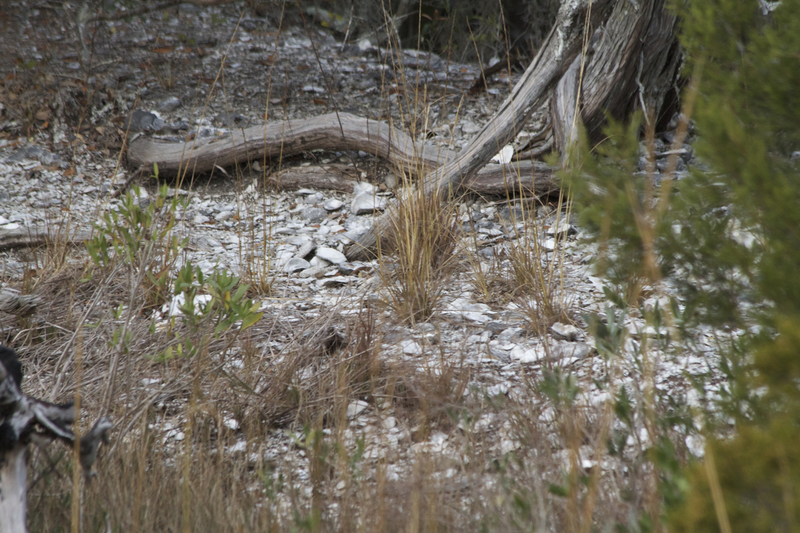 Shell middens (or mounds) are evidence of early complex hunter gatherer societies located worldwide, but I was particularly interested in those on the Southeast Coast. I am still doing more research to learn about the people who constructed the middens. 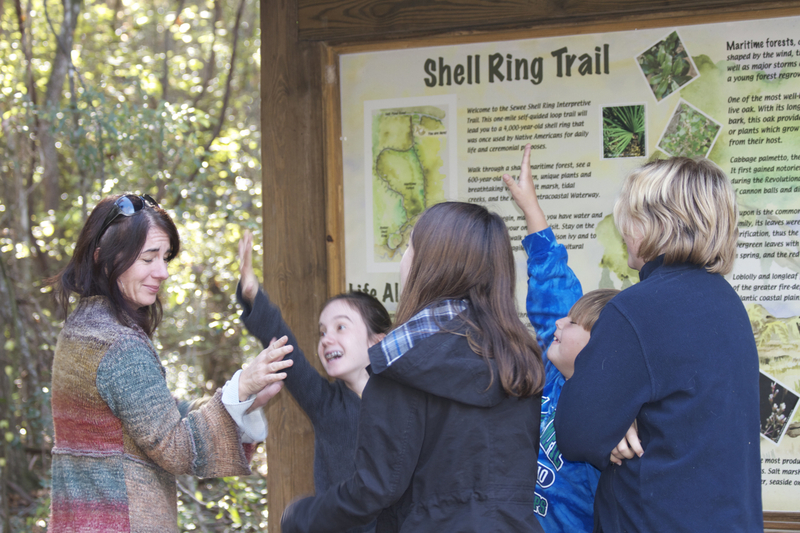 One of the most accessible shell midden sites is located practically in our own backyard, at the edge of the Francis Marion National Forest, known as the Sewee shell midden. 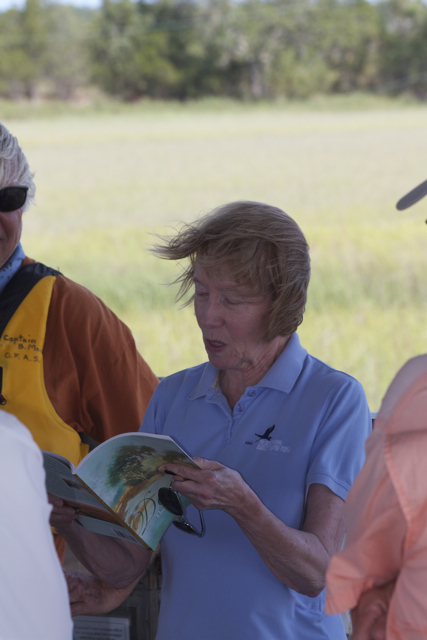 Dr. McMillan explained that the choices of these ancient societies to pile up shells had created micro-ecosystems with much more calcified soils than the surrounding marshes, creating a favorable climate for some surprising botany. Sugar Maples, for example, grew on the edges of some shell middens– a deciduous tree which favors upland soils. And other woodland, upland species grow there as well, including a kind of trillium. Scientists have recently discovered many more archaeologically significant sites by flying over the coast in the fall, locating previously unknown shell rings by spotting sugar maples in their glorious fall foliage. What else do we know about shell middens? Were the seeds from sugar maples and other calcium loving species carried there by the wind or by people for deliberate propagation? One of the trees mentioned is the toothache tree– is that not a native tree for our island? Were our toothache trees brought here from elsewhere thousands of years ago? What did they learn from the newly discovered archaeological sites? What do we have in our archives and nature center from that time period? I’ll keep you posted.